1829: Col. George Blow to George Blow, Jr.
1832: Catherine Mary (Havens) Huntington to Henry Huntington, Jr.
1845: William Hathaway Stiles to Ebenezer Akin, Jr.
1847: William Henry Carle to Henry Disbrow Barto, Jr.
1852: Col. George Blow to George Blow, Jr.
1852: William Felix Davis to Edward Dickson Hicks, Jr.
1861: Ann Zellars to Sallie ? This letter was penned by Sylvester Rounds (1843-1899) who served in Company D, 17th Connecticut Infantry. While serving with the regiment, “Syl Rounds” (as his friends would call him) narrowly escaped capture at Chancellorsville and on July 1, 1863 — the first day of the Battle of Gettysburg — he took a rifle ball in his left shoulder and was taken prisoner. He spent months in various hospitals and never return to the regiment. Eventually he was transferred to the Veteran Reserve Corps in 1864. Sylvester was the son of Levi Rounds (1812-1905) and Catherine Hubbell (1812-1876) of Huntington, Fairfield County, Connecticut. The sister to whom he addressed this letter was Martha Rounds (1847-1928). After the war, Levi returned home and married Elizabeth Drew, the daughter of Wright and Mary (Tomlinson) Drew. He continued to reside in the area and worked as a carpenter — a trade he learned from his father. At Gettysburg, the 17th Connecticut was brigaded with the 25th, 75th, and 107th Iowa under the command of Brigadier General Adelbert Ames in Francis Barlow’s First Division of the Howard’s XI Corps. Their position was overrun near Barlow’s Knoll on the Union Right. Of the 386 men in the regiment who went into the fight at Gettysburg, 20 were killed, 81 wounded, and 96 were reported missing. Another letter written by Sylvester Rounds on 23 November 1864 appears in the blog, Their Stories: In their Words by Britt Isenberg. It is interesting to observe his improvement in penmanship after six months of duty as a clerk in the Provost Marshall General department at Trenton. Well how do you do this pleasant spring Sabbath day. I conclude you are pretty well by what you wrote me in your letter which I have just received, or rather this morning. I thought then I would answer it directly after inspection but after inspection it was dinner time and after dinner I took a nap and when I awoke it was four o’clock, so I liked to of overslept myself a little but I guess I will have time to write you just a few lines to let you know how things are progressing down here in Newark. Well as for progress, I can’t say as there is much — only in the weather part that has finally taken a favorable turn and it is now warm and springlike. Today it is almost as warm as summer and I see that the farmers are beginning to turn out their cattle and to work their gardens. So it must be getting something near planting time. I suppose the season is a little more foreword here than in Connecticut because it is so near the ocean shore. I don’t believe there is a going to be many peaches this year for the trees have not blossomed much. Well I do believe I have slept all my thoughts away for I can hardly think of anything but I will have to try and find something to fill up with and I would like it to be something kinder interesting but I guess I will fail on that part today. You think then that it was pretty near time for the army to move. Well I have been thinking that way myself for the last few days but I guess we will have to wait but a short time. Everything indicates an early start toward Richmond and with Grant at their head, I hope they will be successful and enter that infamous city and show them that northern power isn’t dead yet. That rumor about McClellan’s taking command I guess was nothing but a newspaper story got up for excitement. About week after next I shouldn’t wonder if we had a big battle — that is if it keeps on fine weather. Last year the battle of Chancellorsville was fought on the 2, 3, & 4th of May so you see that they will start about the same time this year, but it will be owing some to how the Rebs move. The papers seem to say that they are moving to attack our army instead of we attacking them. If that is so, why of course we will accommodate them by waiting for them a short time for we would gain an advantage by so doing. Well you asked me if I had heard anything from out west. No, not a word. I don’t see what has become of them all. I should think some of them would write and let us know how they are for some of them must be living. I received a letter from Selah Blakeman ¹ and also one from Theodore Blackman. ² They are getting along first rate at the regiment now. He says Theodore is also at Jacksonville [Florida] — the same place the regiment is at so if he goes ashore, he will have a chance to see the regiment. I also had a letter from J. Henry Blakeman.³ He has started for his regiment again. I have his picture which I will send home. You said you see where Grant was a going to have the Invalid Corps all sent to the front that was able to go and them that was not to discharge. That is what I wish he would do. Anything suits me, but no such thing will happen right away. That has been talked over too much. I expect to go to Trenton in a few days. Me and two others are going or expect to go. Our business will be light. We are for orderlies for Col. [Robert Christie] Buchanan, the colonel that commands our regiment in the Veteran Reserve Corps. Some of them say we will go tomorrow but I can’t tell you when. Direct your letters just the same as you always have and if I do go, they will be sent on to me. ¹ Selah Blakeman was a farmer from Stratford, Connecticut. 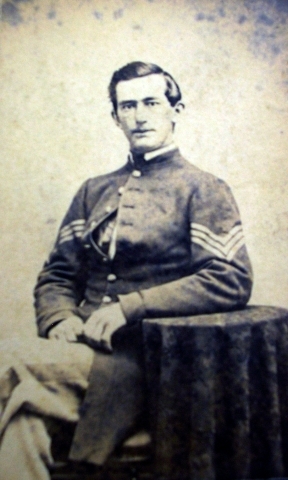 He also served in Co. D, 17th Connecticut, and was promoted to sergeant on 30 January 1864. ² Theodore Hungerford Blackman, born 1837, was the son of William Blackman and Julia Peet Blackman of Huntington, Connecticut. Theodore was the oldest of three siblings and worked on his family’s dairy farm in his youth but had no desire for farming. Blackman along with some friends traveled to Washington D.C. in search of work in February of 1862. On February 7, 1862 he enlisted in the Union Navy at the age of twenty five and was assigned to the USS Harriet Lane a wooden side-wheel steamer. He was given the position of fireman, and was charged with dispensing coal into the ship’s steam boilers. While aboard the USS Harriet Lane, Blackman traveled to Port Royal, South Carolina, Key West, Havana, Vicksburg, New Orleans and Pensacola. In September of 1862 he was assigned to the gunboat USS Unadilla. In January of 1863 the USS Unadilla captured the CSS Princess Royal. In March the USS Unadilla was grounded on Charleston bar, off the South Carolina coast, causing severe damage to the ship’s hull. In May of 1863 the USS Unadilla became part of the Charleston Bar Blockade Squadron which was set up to disrupt the flow of Confederate supplies into Charleston. The USS Unadilla made trips to Hilton Head, South Carolina; Wassaw Sound, Georgia; Port Royal, South Carolina; Jacksonville, Florida; and Tybee, Georgia. In June 1864, Blackman was reassigned to the USS Pawnee, a 221 foot war ship. In July of 1864 the USS Pawnee was sent to the Stono River in South Carolina to attack rebel fortifications along the bank. During the campaign, the USS Pawnee was attacked by two monitors. The battle lasted for one week and the Union Navy succeeded in their plan to draw 15,000 Confederate troops from northern cities to make them more impregnable. In December of 1864 the USS Pawnee was sent to destroy two bridges on the Wright River to sever communication between Charleston and Savannah. Blackman was discharged from the Union Navy and returned home to Connecticut in February 1865. ³ J. Henry Blakeman was from Bidgeport, Connecticut. Like Sylvester, he served in the same company and was wounded on the first day at Gettysburg. We learn from this letter that he returned to his regiment in April 1864.